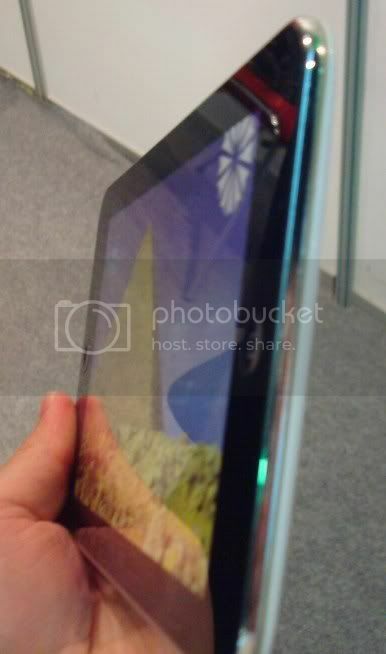 Netputing » Possible picture of Apple iPad? Possible picture of Apple iPad? This might be one of the iPad prototype? Look like the black borders are symmetrical all around. Could hide the wireless antennas quite well. But there is no docking port… so quite possibly a fake ;-( Look good anyway. UPDATE 2: OK, Someone pointed the fact that left might in fact be right 😉 So what I thought would be the bottom of the unit might be the top, hence no port there to be viewed. Update 3: Look at the white back of the unit. This could possibly allow people to buy it in different color like it is possible for iPods. It is the MID 700 from BoEye. 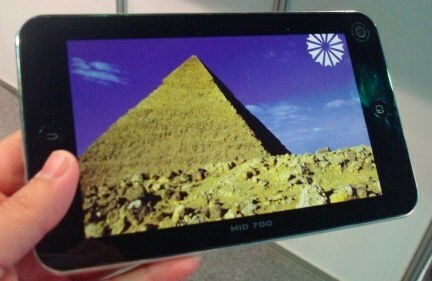 The product was shown at Dubai’s GITEX. So now let see what Apple really come out with tomorrow! but we’re not looking at the bottom. see the round button at the other end? I’m pretty certain the “bottom” of the device will be along a long edge, not underneath either home button. It’s not going to be a typically portrait object. Notice what appear to be a white back to the unit. Could this spell different back color like the iPods? Would allow for differentiation and would point to a Fun device.